Recently this photo was published by the Associated Press and has been getting a lot of attention on the interwebs. It shows Lance Cpl. Joshua Bernard, an American solder in Afghanistan, after being hit by a mortar attack and only hours before death. A lot of the debate participants seem to feel one way or another depending on how they feel about our war. But I think the debate deserves to be much more complicated and nuanced because there are actually a lot of issues at play here. 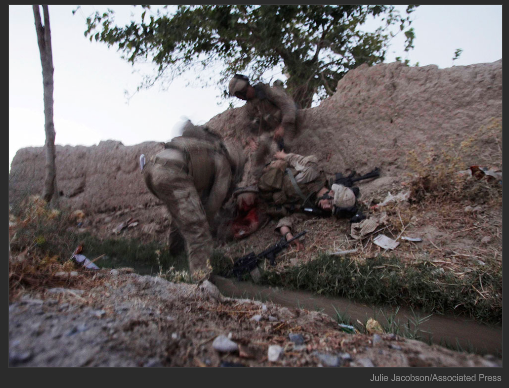 The photo was taken by Julie Jacobson, an Associated Press photographer embedded with the US military in Afghanistan. The military embed program was created by the US government as a way to help get good press about the wars in Afghanistan and Iraq. I don’t mean this in a cynical way. I’m not suggesting they expected to only get good information out of the troops. But by embedding reporters, the government felt the reporters would see how well we were doing and understand the war from the point of view of an insider. After all, media coverage of Vietnam was completely out of the government’s control and was yet another input (among many) that caused people to be opposed to the war. And, of course, in exchange for protection of the embedded reporters, the government does have some rules. For example, reporters may not report on the deaths of soldiers before the family is notified. Photographers may not publish photos of soldiers dying that are close and clearly show a soldier’s face. And, in this case, the photographer did not break any of the military’s rules in publishing the photo. Some people have accused the AP of having a political agenda in publishing the photo. I don’t know for sure, no one can except for those who made the decision. They certainly claim they didn’t. I’m inclined to believe them because most people consider Afghanistan to be the justified war. Whereas we went to war against Iraq simple because Bush/Cheney/Rumsfeld felt like it, Afghanistan explicitly supported Al Qaeda, who had attacked us. Now, personally, I’m not a huge fan of wars, but between the two, it actually made sense and could be morally justified. From what I’ve seen on TV polls (along with gain of salt) most people believe this way. So what agenda would the AP have to prove? One of the biggest reasons for publishing the photo, according to the AP, was to make Americans aware of the cost of war. Most days, as the media won’t shut up about Jackson, Jon and Kate Plus 8, or some other banality, I forget that we’re even at war. It was already happening at the end of the Bush presidency, but I think once Obama was elected and the financial world melted all around us, everyone forgot about Afghanistan and Iraq. There are still people who are losing brothers, father, daughters, sisters, mothers, husbands, and wives to these 8 year old wars. We forget this. Heck, we weren’t even allowed to see photos of coffins of dead soldiers until recently. So, on the one hand, I think perhaps the AP had a good point here. Perhaps it’s good to show photos of people dying because that’s what war is. People die. And, it’s easier to dismiss words (someone’s name) than a photo of another human being blown to bits. Perhaps, some people think, if everyone had to see the price of war we’d have less wars. Perhaps…. Of course, a lot of people complained that to show this photo of the Marine dishonored him. I don’t understand how that works, so I’m not going to take sides. But where were these people to look out for the honor of the hundreds of photos I’ve seen of dead Iraqis and Afghans? In fact, lots of people in the comments of this photo (in the NYT photoblog Lens) said they could have showed the price of war by showing dead Iraqis or Afghans. The reality is that’s “THEM”, but when it’s “US” that’s a different story. I think it should be all or nothing. Some people objected because they said it was a gruesome photo that had no business messing with their sensibilities. But this photo is nothing compared to what I’ve seen in movie or video games. I, and most people 30 years old and younger, have see much worse in video games. And anyone that’s seen a horror movie has seen much worse. I think the gruesome aspect is just a wallpaper over their real objections – whatever those may be. In my eyes, the reason it was wrong of the Associated Press to publish this photo is because they went to the soldier’s family and told them they were going to be publishing this photo and the family told them ‘no’. The way I read it (and heard it on NPR), they went looking for the family’s blessing and were denied. And, to me, if you’re going to go ask permission, you should respect the result. If they just ran it and then the family complained that would be different. But to go and hope for that soundbite saying they thought it was cool to show and then getting denied by showing it anyway was wrong. So why did I publish it? Quite simply because you can’t make a judgment one way or another without seeing what’s in the photo. Your mind would probably picture something more gruesome or even less gruesome than it really was. Then your outrage or lack of outrage wouldn’t be correct. Another reason, when listening to NPR coverage of the photo scandal, a marine called in. He said that when he first heard about the photo he was pissed. But when he actually saw the photo, he saw it as a moment showing his comrades rushing to help him. It wasn’t disrespectful at all. And he said he wouldn’t mind a photo like that being published with him as the subject. So, I think it’s very important to form an informed opinion and for that you need to see the photo. Otherwise we just end up polarized arguing this way or that way just based on the political party we support. Now, finally for my opinion of the photo itself. (as you read two paragraphs up, I don’t think it should have originally been published) To me this is merely a photojournalism photo. The photographer is capturing what happened in front of her lens. The photo stands as a an example of the realities of life. Someone is dying as many people do daily. This man died in action, not laying in a bed or drunk at the wheel of a car. If he were my brother, I would cherish this photo. I would not have to imagine how he died, I would see here his last moments. After all, don’t we all want to be there in our loved ones’ last moments? I have always been a fan of photographers who document the last moments of those in their family. It is a way of dealing with the fragility of life. Sure, you don’t want to remember your family members that way. I certainly don’t want to remember my grandmother’s last day on Earth. But at the same time, something about capturing that last second or hour just need to be done. Perhaps so you can say, she was like this at the end, but like this (an earlier photo) when she was strong.